PRIMARY CHARACTERISTICS: Quiet unassuming knowledge and capability, at peace with himself and the world around him (in as much as that is possible surrounded by the pain of an imperfect world); that is how I would describe my grandfather, Spencer Lewis Frey. He was abundant in what I would now call “shalom” =that comfort coming from knowledge/respect of self (but never self-righteousness), combined with knowledge/respect of the physical world around him, and also knowledge/respect of the non-physical world around him. This created a one-ness and complete-ness which I don’t think that I have ever seen in another human being. Deeply spiritual in a rather unconventional way, he attended the local church until the family had too many children to travel on only two horses, but then he didn’t appear to feel a loss of the missing fellowship. Surrounded by the animals, the trees, and the mountain, he had wonderful fellowship with our Creator. He didn’t talk much about his relationship with the Divine, but it was obvious from his actions. 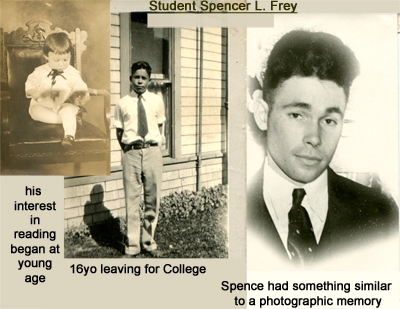 GIFTING: Spencer was academically gifted and enjoyed books from a young age; both non-fiction and fiction. In fact, his photographic memory and facility with foreign languages created an intellectuality bordering on “genius”. This intellectuality was balanced by a strong enjoyment of physical action. He could have taken on any occupation he chose, and I think he knew it. So he became the epitome of a “cowboy”. 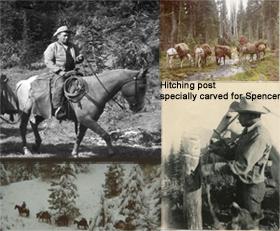 It is a demanding profession but Spence was a hard worker; his knowledge/respect for the nature of the animals he worked with created unity wonderful to behold. Spencer was gifted in so many areas that his lack of communication with children was very noticeable to me. It seemed incongruous. FAVORITES: Fast cars and car races were two of Spencer’s favorite things, so it was no surprise when he bought a ’61 white Corvette with red interior. Then he bought a white Corvette Stingray (also with red interior) in ’73! 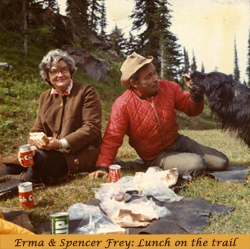 It is a funny thing, Spence was a very masculine man (not what we term “macho” but a man’s kind of man) and yet his favorite color was considered by many people to be somewhat feminine; red. When asked about interior decorating in their log cabin, he told my grandmother, “Any color is fine; there are many varieties of red”. His favorite shirts had pink and red as prominent colors. That could have been one element contributing to the common belief that he was half Native American. The Frey-Spencer family of his youth and early adulthood was very musical, but Grandpa was devastated by the early death of both his siblings and seldom sang again. Once in a while he sat on the floor beside the wood cook stove and played his harmonica or sang cowboy ballads. HEALTH: His first massive heart attack was at 41 years old. 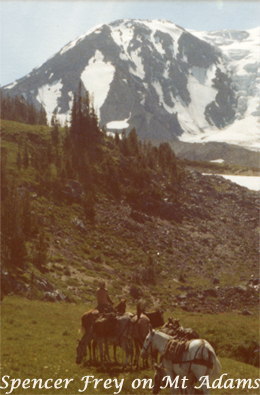 Generally, he had another one every seven years so it was no surprise when his doctor said that he must quit the hard labor involved with hosting pack trips up into the wilderness of Mt. Adams and Indian Heaven. Spence decided that this lifestyle was a priority for him and he didn’t want life without it. 22 years later he died on the back of a horse, up on the mountainside.